The idea for the Food House Project™ grew out of our efforts to become increasing self-sufficient in our food growing and food independence. Dr. Michelle Schoffro Cook is an international bestselling and twenty-time published book author and blogger for DrMichelleCook.com as well as the highly popular health and environmental site Care2.com and Curtis Cook is a long-time business consultant who increasingly became involved in food security and local food movements. We both share a passion for great food and healthy living. We’ve watched the food supply become increasingly degraded through pesticides, additives, genetically-modified organisms (GMOs), poor agricultural practices, and industrial processing. We decided to take action by growing more and more of our own food. Starting with indoor sprouts over two decades ago, to more recently when we dug up most of our suburban lawn to turn it into fruits and vegetables, to now: buying an old farmhouse on an acreage and breathing new life into the home and land. We have big plans, a tight budget, and a steep learning curve, but we want to share the whole adventure with you. Welcome to the Food House Project™! We're thrilled to officially launch FoodHouseProject.com on Earth Day! It seems fitting given what our site is all about: empowering everyone to start growing at least some of their own food to help reduce the burden on planet Earth. This is why my husband, Curtis, and I launched FoodHouseProject.com, where we are converting our century old farmhouse into the ultimate food house: a home where we showcase the best in many forms of food growing to demonstrate how easy it is and how realistic it actually is for everyone to grow at least a portion of their own food. To that end, we’re diving head-first into old school gardening like container-growing and plots of land for growing fruits and vegetables as well as cutting-edge vertical growing, indoor microgreen growing, and much more. We’re combining Curtis’ extensive food security background with my nutrition knowledge and aversion for corporate agriculture giants, with our combined love of gardening and food, transforming our neglected old farmhouse into a modern-day show home of food-growing possibilities to inspire everyone to start growing their own food. And, for Earth Day, we’re issuing the FoodHouseProject.com Challenge to everyone to start growing one or more of their own foods. Take the plunge even if you have never grown food before. It’s easier, and far more rewarding, than you think. Tell us what you're up to and what you'll be growing, whether that will entail herbs on your balcony, sprouts or microgreens on your countertop, or tranforming your lawn into food central. We'd love to hear from you. Tell your friends. It's time to start the Food House Revolution to green up the planet and transform your health and the health of your family and friends! Happy Earth Day! Let’s face it: most of us had a parent who would command us to eat our vegetables. I recall my mom telling me “eat your spinach, it’s good for you” fairly frequently. And, I’m sure my childhood wasn’t that different from most peoples’ at least when it comes to the regular parental vegetable interventions. Something tells me that few parents, if any, ever uttered the words “eat your red cabbage microgreens.” But, maybe that’s something today’s parents could try out. I can almost hear the parental refrains around the globe. Okay, maybe not, but it might be a good idea. Microgreens are miniature seedlings of herbs and vegetables that can be grown in a week or two instead of the typical months needed for the full-size plants. 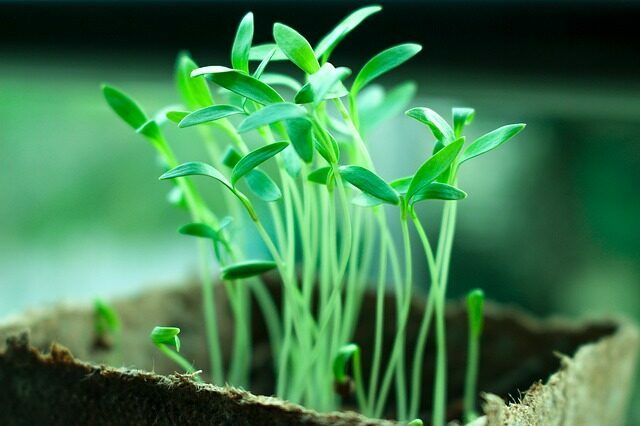 Another study published in the Journal of Agriculture and Food Chemistry found that microgreen leaves can contain up to 40 times more nutrients than their mature counterparts. This increase in nutrients may explain why the red cabbage microgreens were so effective at improving the risk of heart disease. Red cabbage microgreens have all the beneficial nutrients of full-size cabbages, but magnified many times over. You’ll also get all of the hormone-balancing and anti-cancer benefits of the unique compounds known as glucosinolates that are found in cabbages. The latter study examined the nutritional status of 25 kinds of microgreens and found that among those assessed, red cabbage, cilantro, garnet amaranth, and green daikon radish had the highest concentrations of nutrients like vitamins C and E, as well as carotenoids like beta carotene, lutein, and zeaxanthin. All of the caroteinoids have been linked to improved eye health as well as the cardiovascular benefits. While the above four types showed the highest nutritional value, there are many other foods that can be grown and eaten as microgreens, including: basil, Brussels sprouts, cauliflower, kale, and lettuce, to name a few. The other amazing thing about microgreens is their ability to be , even in a small space, with minimal effort. Once you experience the many potential health benefits of ramping up the nutrients in your diet with microgreens, growing them may become your favorite year-round pastime. And, regardless whether you’re growing your own microgreens, your heart will thank you for enjoying them as part of your daily diet. Since 1970, people around the globe have been celebrating Earth Day on April 22nd. Considering the state of our planet and the political, corporate and industrial forces that seem intent on destroying it, everyday should be Earth Day. Our world needs more care and healing and, in the absence of true leadership from elected officials and the business elite, it is up to “the little people” to lead the way. In honor of Earth Day, here are seven ways you can eat an earth-friendly diet. 1) Grow your own food: It sounds crazy, but something our ancestors did naturally for millennia has now become one of the most significant acts of revolution we can undertake. At the turn of the previous century, most American households grew all or most of their own food. As late as the mid-1980s when they passed away, my grandparents purchased staples such as flour and salt at the grocery store but grew everything else. How did we get so far removed from this natural act? The short answer is this: we have been told for decades that buying your food in stores is a sign of affluence. Now that food production is industrialized and run by companies equally interested in chemicals, buying food in stores is increasingly associated with obesity, diabetes, heart disease and other diet-related diseases. Do yourself a favor and take charge of your personal food supply. Whether you have a balcony, a backyard or an acreage, give it a try. You’ll be surprised how easy and rewarding it is and you’ll be even more surprised at how much delicious, fresh food you can get out of even the smallest spaces. 2) Eat local: If growing your own food just isn’t feasible, consider stocking your pantry with locally-grown products from markets and independent grocery stores. Many smaller produce markets and even some health food stores stock fresh fruits, vegetables, herbs and prepared foods from local producers. Not only do you support your local businesses and keep dollars in the local economy, you cut down on the amount of food that needs to be shipped into your community from elsewhere. Less shipping means fewer trucks on the road and fewer fossil-fuel emissions into the atmosphere. 3) Buy food from local farmers: Buying directly from local farmers ensures that your food doesn’t make the lengthy trip to your grocery store, a trip which causes untold pollution and greenhouse gas emissions. You’ll be rewarded with much more nutritious food as well. That’s because food quickly loses its nutritional value after it has been picked. Those precious first days in transport causes a significant loss of nutrients. 4) Eat more plant-based foods: No matter how some people try to spin the facts, the reality is that a plant-based diet is far better for the planet than to use the extensive resources required to grow meat and poultry. Additionally, plants actually absorb carbon dioxide emissions while animals emit them. 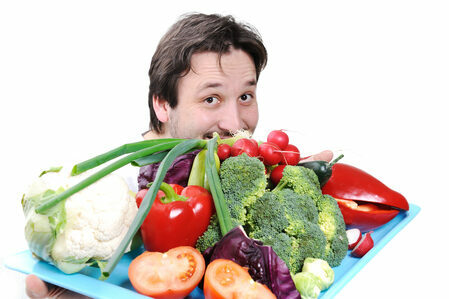 The bonus is that countless amounts of research shows that plant-based diets are far healthier for your body as well. 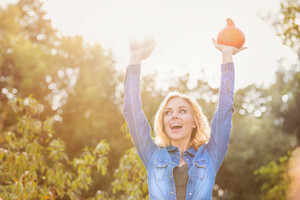 A study published in the American Medical Association’s own online journal JAMA Network, found that eating a plant-based diet was more effective than other diets to lose weight. Another study published in the journal Progress in Cardiovascular Diseases found that a plant-based diet slashes mortality risk from heart disease by a whopping 40%. A plant-based diet is healthier for you and the planet. 5) Choose chemical-free or organic: Buying organic means that you’re not supporting chemical-based agriculture. 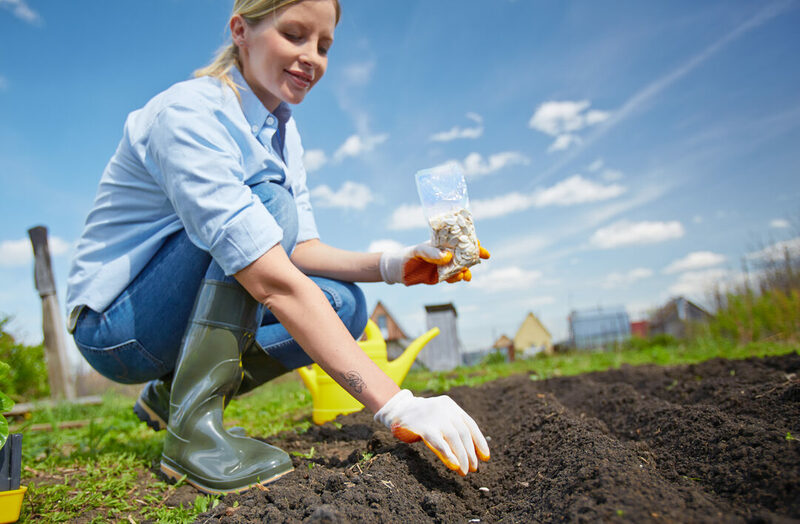 When you buy organic, or better yet, grow your own food organically, you’re helping to ensure that many acres of land will not be sprayed with toxic chemicals—chemicals that have been linked to many diseases, including cancer. 6) Drink purified tap water: Choosing tap water over bottled water helps to ensure that billions of plastic bottles don’t end up in landfills, roadsides, or waterways. Even the simple act of carrying your own reusable water bottle that you refill can help make a difference to the level of plastic pollution on the planet. 7) Eat fewer packaged and processed foods: Making your own food from scratch isn’t just better-tasting and healthier, it reduces the amount of waste in landfills, as well as the amount of packaging that needs to be processed even if it is recycled. It’s a simple act but just choosing foods with less packaging, or better yet, no packaging at all, will make a big difference to the planet. Those of you following our adventures remember that we took two storage bins without lids and made a window sill greenhouse for some organic potato cuttings. 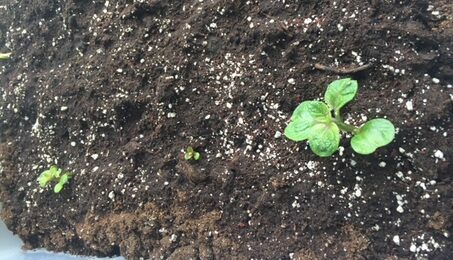 That was thirteen days ago and we have some good news: the potatoes are growing! The first three plants have broken the surface and are looking good. The one on the left could be two separate plants. It is great to have more food growing in the house as we wait for the ground outside to thaw. You may notice a little green shoot in the top left corner of the picture. That is a garlic clove Michelle added to the bin a few days ago. She now calls it our "hash browns bin" but I think it needs onions to live up to that name! The 130 year-old house Michelle and I bought does not have a proper kitchen. Previously transformed into an office and subsequently neglected by the former owner, the house has a small kitchenette with about a foot of counter space in what we are now using as a new laundry room (the house didn’t have one of those either!). Such a small space makes food prep and indoor growing challenging. We have picked rooms on the main level to be our new kitchen and pantry but it takes time to get everything installed. From cupboards to countertops to appliances, we are starting from scratch. And our main goal is to create a kitchen that supports growing, harvesting and preparing our own food. We haven’t picked out all of our appliances but we know one thing: our Urban Cultivator will be designed into our new kitchen space so we have state-of-the-art microgreen growing right in our home. If you aren’t familiar with the Urban Cultivator, it is an automated, dishwasher-sized device that fits seamlessly under a standard kitchen counter. 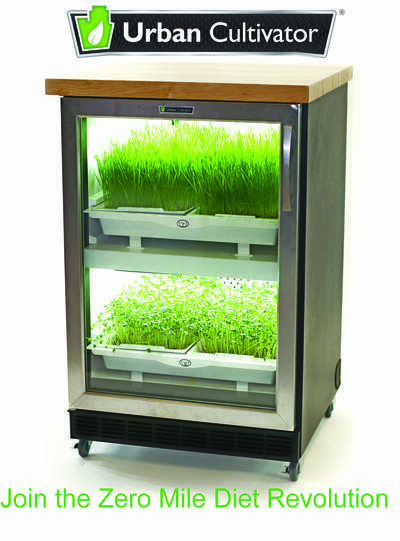 It looks great and makes growing microgreens (sprouts and herbs too!) easy. It works with both soil or non-soil growing media and a wide variety of seeds so you’ll have a great variety. With four growing trays divided between to levels, you can grow a number of different plants at once. Our first attempt included broccoli, kale, arugula and basil microgreens and they were all successful. The freshness and flavor is unbeatable because you are trimming them as you need them. The other great thing about the Urban Cultivator is that you can further automate it by plumbing it directly into your water line under your sink so that it monitors and refills the water reservoir. Because our kitchen is not yet installed, we are using it in manual mode which means we drain and refill the reservoir with fresh water ourselves once a week. It takes about five minutes and the actual drainage is still automated so no hardship here! 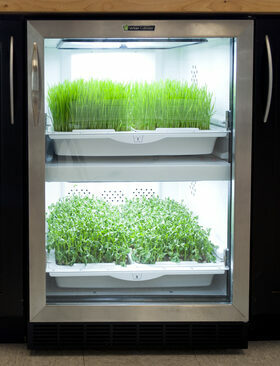 We are loving our Urban Cultivator and now have radish and Thai basil microgreens growing together in one of the trays. The radishes will mature much faster but we’ll always have a diversity of delicious, ultra-nutritious microgreens from which to choose. Stay tuned for more microgreen information, including why you need to get more of these superfoods into your diet, as well as a step-by-step blog on using the Urban Cultivator. In case you missed it in January, I encourage you to check out the study released by the Lancet Commission on Obesity earlier this year. It clearly and concisely documents the link between global crises that many people, particularly policy makers, don’t understand or don’t wish to acknowledge. The 3-year study engaged experts from several countries and illustrates how global public health issues across the spectrum from widespread hunger to undernutrition to obesity all stem from the same root causes. As Ronnie Cummins, International Director of the Organic Consumers Association (OCA) writes in his essay on the study, that source is “an unhealthy, inequitable food system perpetuated by a political and economic system largely driven by corporate profit.” And surprise (unless you’re paying attention to what is going on around you and then it is not surprising at all): the Commission found that climate change also shares this root cause. Cummins does a great job of capturing the significant findings of the study. If you don’t have time to read the full study, click here for Cummins’ excellent summary and commentary. We can all do something to take back our power when it comes to our food choices and the impact these choices have on the planet and our health. You don't have to become an organic farmer to make a difference. Arm yourself with knowledge and start asking questions of your political representatives, your grocery store managers and the restaurants you enjoy. And come back to the Food House Project often. We will be doing our best to share food knowledge with you so you can make informed choices about your health and well-being. After all, it is more important to feed your body and soul rather than feeding the bottom line of degenerative agriculture corporations. When you move, you often end up with assorted boxes and containers. As survivors of numerous long distance moves, we have our share of plastic bins and over time, we misplace or break lids. So, what do we do with the lidless bins? 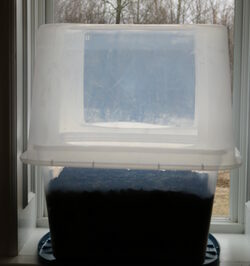 Make a miniature windowsill greenhouse for potatoes! 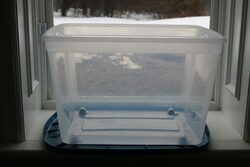 We took two clear plastic bins of different sizes and noticed the larger one fit nicely as a dome on the smaller one. 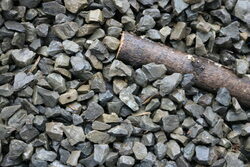 We gathered up some sticks and stones for the bottom bin to create some drainage and to reduce the amount of growing medium we would have to use. Next, we added organic soil just past the halfway mark. 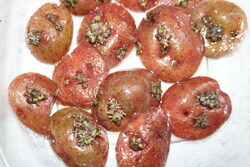 Three days earlier, we had baked some organic potatoes and prior to preparing them, we cut off a bunch of the eyes – the small buds or sprouts that form on the potato. We soaked the eyes in a bowl of water, draining, rinsing and refilling each day to keep the water fresh. Now, those potato chunks with the eyes were ready to go in our bin. After adding the potato chunks, we covered them with additional soil, watered them and placed the larger bin over the smaller bin. In our south-facing window, it didn’t take long for warmth and moisture to start forming even as the ground outside was still covered in snow. We’ll water it regul arly and ensure we cover the clear sides of the lower bin with dark fabric before actual potatoes start to form because we don’t want them to turn green from exposure to light. We’ll keep you posted on the results! If you are going to have plastic in your life, you best use it and reuse it to keep out of the landfill as long as possible. Bins like these have a million uses, many of which are related to growing your own food. Think outside the bin! Our community has a pretty good recycling program but we still try to find multiple uses for consumer products that typically have a single use. 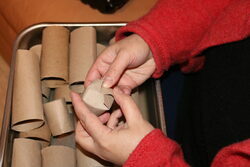 We aren’t making our own toilet paper yet (don’t see that on the short list of projects!) 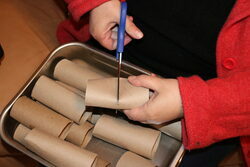 so we have these unbleached cardboard tubes when the roll is empty. It turns out they make great seed pots for starting your herbs and veggies indoors. 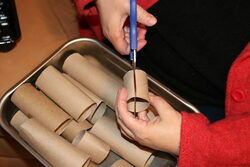 Take a toilet paper roll and cut it in half. Make four half-inch (just over 1 centimetre) cuts equally spaced on one end of the roll to make four flaps. Fold the flaps in like you are closing a box lid with one side of each flap tucked under the next flap. Congratulations, you just made a seed pot while you were watching Netflix. Fill each pot with good quality potting soil and plant a couple of seeds in each. Place them in a waterproof tray and give each pot a good soak to start. The seed you planted will determine how long it takes to see a seedling poke out through the soil. By starting them indoors, you can get a jump on the season and give your plants a head start. This is especially helpful in northern climates with shorter growing seasons. Your toilet paper roll pot should be able to contain most veggies until they are ready to transplant into a larger pot or directly into your garden. Pick a day when you have not yet watered your pots and bring them to their new home. Gently open up the flaps to expose the roots and place the entire pot in the new soil. The cardboard will continue to break down but in the interim, it will help support the young plant in its new surroundings. Water the transplants and watch them grow. Don’t forget to plant some of the same seeds directly into the garden to get two staggered crops of great food in one growing season. 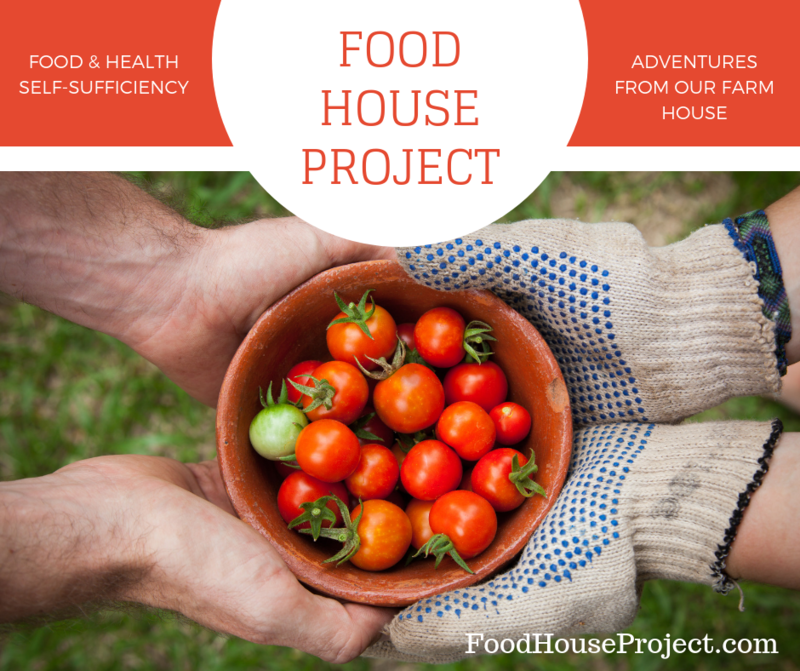 The Food House Project is all about empowering yourself through food self-sufficiency and food independence. On the most elemental level, it means taking great care of your health. 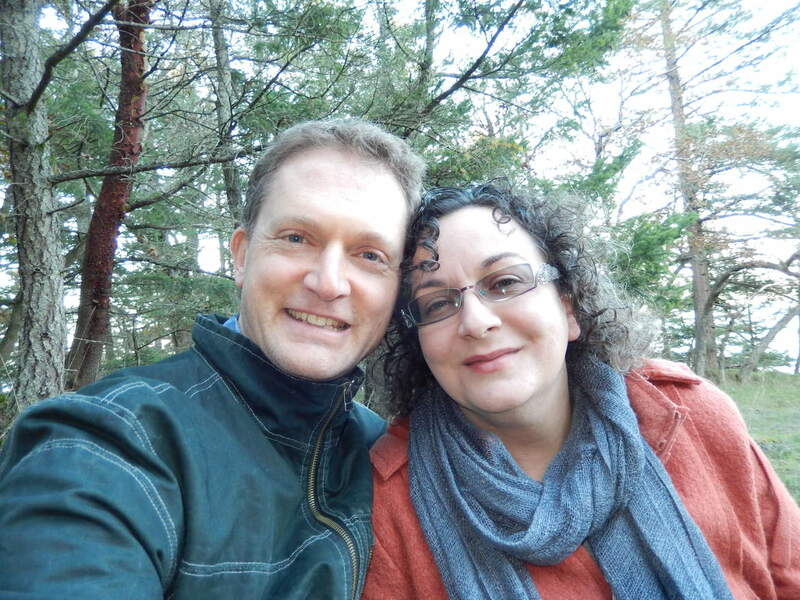 My husband Curtis and I started this adventure many years ago, trying to become more responsible for our own food every year and not relying on a questionable food supply chain that doesn’t really care if we are healthy or not. It turns out we are on the right track, according to a recent study of the Tsimane people of the Amazon, arguable the healthiest people on the planet. The study, published in The American Journal of Clinical Nutrition, found that the Tsimane people have been minimally impacted by food trends around the world and buy only a small amount of their food from markets. The researchers also found that they eat a high carbohydrate diet, getting 64 percent of their daily caloric intake from carbohydrates, 21 percent from protein, and a surprisingly low amount of fat with only 15 percent of their intake coming from fats. Carbohydrates form nearly two-thirds of their diet with rice and plantain acting as staples. Based on their diet, the Tsimane people of the Amazon almost never suffer from heart disease. And, that’s not all: they rarely suffer from high blood pressure, high cholesterol, obesity, and diabetes. These diseases and conditions run rampant in our industrialized societies. The dietary guidelines for Americans recommend getting 45 to 65 percent of carbs, 10 to 30 percent from protein and 28 to 35 percent from fat. The Tsimane people are on the high side of the carb recommendations, middle of the protein recommendations, and much lower than the fat recommendations, suggesting that the guidelines may need revising in consideration of such profound evidence that the Tsimane diet is superior to just about any diet around the world. Of course, the particular foods they eat should also be considered, since caloric intake only provides a small amount of the picture. The Tsimane purchase only 8 percent of their food from stores. Additionally, they eat over 40 different species of fish. The researchers also found that, unlike most people of the western world, they suffer from few nutritional deficiencies and have high intakes of magnesium, potassium, and selenium. Considering that the researchers believe the Tsimane have the healthiest hearts of any they’ve seen, it’s not surprising that their diets have high amounts of magnesium and potassium—two critical minerals for heart health and for which many people who eat a Standard American Diet (SAD) are deficient. The Tsimane eat almost twice as much fiber in their diet as most Americans. While they have traditionally eaten only small amounts of oil, salt, and sugar, pressures from globalization are causing them to start eating more of these less-than-healthy foods. They are also highly active people. While they don’t engage in routine exercise, they remain highly active by growing or foraging foods from fields and forests. Who needs and gym membership or expensive yoga sessions when you can tend a garden or hike through the woods foraging responsibly? These are great ways to stay active and engaged with the food we put into our bodies. Not only is the resulting food typically higher in nutrition, it is also lower in pesticides and other toxic chemicals we shouldn’t be putting into our bodies. It seems that the Tsimane people have figured out how to maintain a healthy heart and body. We could learn a lot from their example. Happy Spring Equinox. Not only is today the first day of Spring, it is also "Plant a Seed Day." In our part of the world, it is too early to break ground and start the food gardens outside but that won't stop us from planting inside: we have pots on the go, sprouts are sprouting and microgreens are greening up. It feels great to celebrate the amazing power of these tiny seeds and show gratitude for the abundance they provide us. Keep posted as we show you all kinds of options for getting your seeds started indoors. Now that Spring has sprung, get ready to watch life blossom around you! 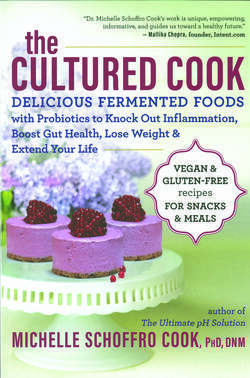 Dr. Michelle Schoffro Cook is a best-selling & 20-time book author and popular blogger for DrMichelleCook.com and the world's largest health and environmental site Care2.com. 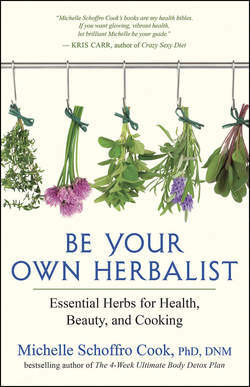 Her books include: Be Your Own Herbalist, The Cultured Cook, and Cancer-Proof. Curtis Cook is a former international business consultant who now focuses on his passion for local food movements and resilient communities. They share a love of great food, gardening, nature, and each other. 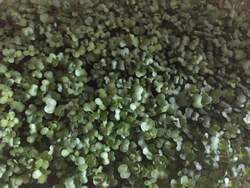 Broccoli microgreens after 1 week! © Copyright 2019 Michelle Schoffro Cook and Curtis Cook. All rights reserved.